Hi All! And a Very Happy Tuesday to you! Welcome to our May Sneak Peeks! 8-) We have lots of Fun inspiration to share Today through Friday. All of the new products will be available for purchase on Thursday, May 9th at 8 am PST. You'll find it all in the Fresh out of the Oven Department at the Taylored Expressions Store. I chose Simple Stories Urban traveler 6x6 collection combined with Bazzill CS, Kraft CS and Choice Buttercream CS The Brand New Band It Dies and TE's Chevron Border Die, a Clear Cardbox and some Fun Test Tubes for my Fun Gift packaging! I stamped my Greetings For Him sentiment with Memento Rich Cocoa and added a touch of shading with Antique Linen Distress ink. Love love love this project! So hard to do handmade gifts for guys - this one is perfect! Oh Wow! this is awesome Shannon! what an amazing design… I love the Popcorn Gift Set and matching card… the papers are gorgeous! hubby is going to love this SO much!! Hope you are well hun... sorry I have been a bad blogger lately..
Shannon, this is so cute - and fun - and tasty looking!!! Love the little popcorn holder and the chalkboard technique on your card is wonderful! Great gift for father's day! I love it - popping corn for your 'Pop' (I always called my father 'Pop'). You are so talented! I love your work. What a fabulous gift set, Shannon! Love all the chevron die strips across the packaging and card! 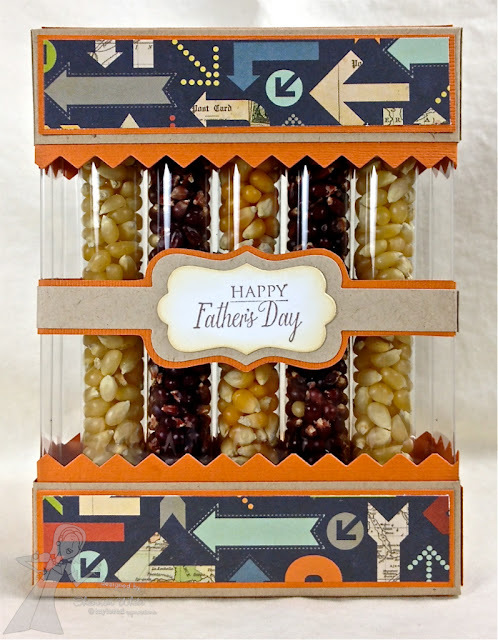 This is the perfect gift for your popcorn lovin' hubby! What a fun gift project, Shannon! Wonderful idea! It makes me want to go make some pop corn tho LOL Darling! Looks like we were on the same wave length with the chalkboard technique and chevrons....love the colors you used on the card and OMG.... What a fabulous popcorn gift!!!! Your hubby is going to love this!!!! This looks fantastic Shannon and such a super idea. What a wonderful and creative card and gift set! 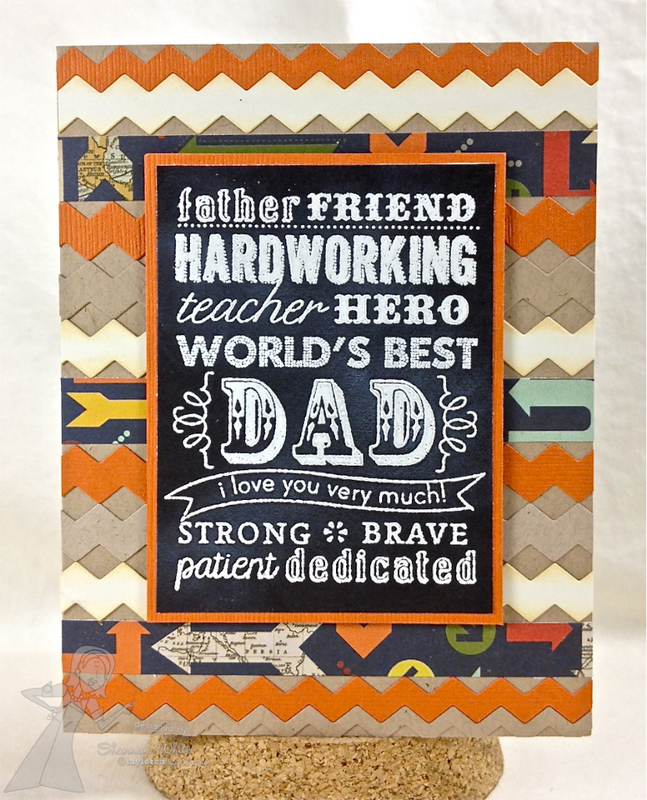 Wonderful Father's Day present and your card is great! what a perfect Father's Day ensemble Shannon! I love the popcorn treat presentation and the chalkboard sentiment! Wow! This is such an awesome gift and I love your papers and design. Gorgeous card! Awesome project, Shannon, your hubster will love it! Love the packaging, Band It die, and chevrons! Love the GG Dad too, an all around wowza! Hugs! Ooooo...hubby is sooo going to love this! Great job on it, Shannon! What a fabulous gift! Your matching card is just as fabulous! Awesome creations, Shannon! OOOH!! This is just the BEST creation! 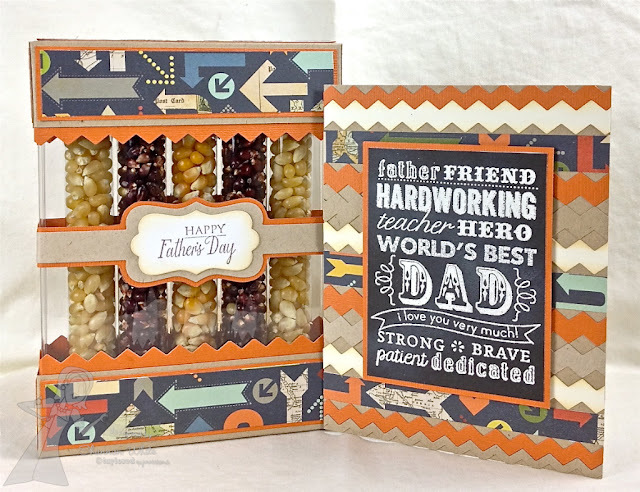 LOVE your paper and the popcorn and the white embossed sentiment on the matching card! WOW, Shannon!! !